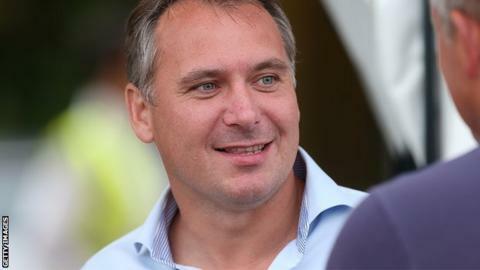 Eastleigh chairman Stewart Donald says appointing a new manager to succeed Richard Hill will not be "a knee-jerk reaction". Hill resigned from the National League club on Wednesday after four defeats in five league games. The former Watford, Oxford United and Northampton Town striker led them to the promotion play-offs last season. "We need to take stock, but there's some quite interesting applicants already," Donald told BBC Radio Solent. Eastleigh are 11th in the National League, without a win in five matches, but are only three points off the play-off places. "It's a vitally important decision to get right, there won't be any knee-jerk reaction to it," Donald added. "We'll see who applies and put some feelers out. But I've been busy within hours of announcing Richard's departure and it looks quite an attractive job." Hill's exit came as a surprise to Donald, who appointed him manager of The Spitfires in September 2012. They were promoted from National League South in Hill's second season and missed out on promotion to the Football League at the first attempt after defeat in the play-off semi-finals against Grimsby in May. "From my perspective, Richard would've definitely been allowed more time to get through this tricky patch," Donald said. "But the decision to leave was completely conceived by him and that is so typically Richard Hill, doing what's best for the interests of Eastleigh Football Club."